We made it to week three! More than half way through our journey of Advent. The readings and season seem full of shadows and reminders of how difficult everything is. From John calling us all vipers to fewer hours of sunlight, the illumination of hope can sometimes seem dim. And when times are tough we have two choices: we can cry or we can… laugh. Have you ever had one of those days? You know the ones I am talking about; the ones where you are a teenage girl and following all the rules and suddenly you are pregnant and unmarried? I don’t know about you but I have had a few laugh or cry days and even those pale in comparison to what Mary was facing as she awaited our Christ. So she did what she could do. She rejoiced. She leaned into the Psalms like todays that ask for help and she rejoiced in her circumstance understanding that the Lord restores our hope even if the world only sees it as a dirty little thing. When we rejoice, we offer what we have- what little or lot it may be and God gives us hope in return, cleaned up, shined up, washed and ready to share with the world. So today, we rejoice. It is Gaudete Sunday- the day of rejoicing in the midst of the shadow and gloom. How do we do that though? What kind of joy is there to offer up in difficult circumstances like Mary’s where death is now the imminent likelihood? Well, I can assure you it is not the happy skippy-joy-joy of Disney. Rather it is a joy that is deep and teary and passes all understanding. It is the joy when a loved one dies after a long illness or addiction- that they are finally free. It is the joy of watching your child go off to college and no longer “need” you. It is the joy of being too poor to go to Paris for a date and being able to rely on your imagination which is infinite and will take you to Mali and Ireland and Taiwan too. It is the joy that lets a young girl sing out with tears streaming down her face and offer her life, her body, and her future up to God with praise. It is the offering of the tears- that is the kind of joy I am talking about, the very last thing we have, and giving it up to God by choice frees us from our shackles. It is a letting go and letting God. John knew what it was to just offer up what we have. He lived in the desert for goodness sake. He was not on the social ‘A’ list- awkward at best and just plain unpleasant and offensive at worst, he offered up what he had- that he could point to Christ and let the world know the Messiah is coming. 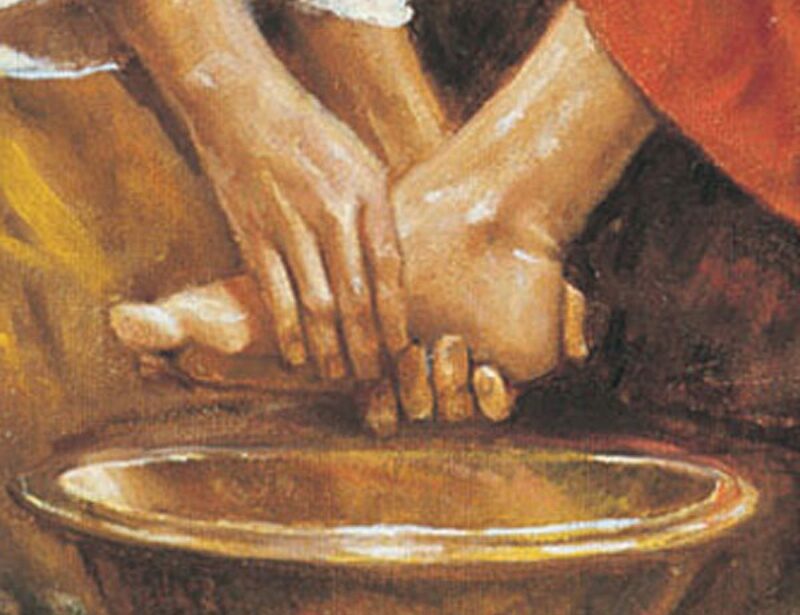 He offered up plain water and baptism that was in many ways just an action- it did nothing. No special promises, just washing clean the body so that they might be ready for the Messiah. But he knew in offering up his plain old baptisms, and his rough course language and truth that the Lord would restore the people and they would be ready for Jesus who would come and offer a new baptism that not only washed them clean but literally make them new. It would not just restore the hope and promise- it would be a whole new promise, a whole new way of loving and living, with an eternal twist that would grant joy beyond understanding. Have you ever had tres leches or rum cake? Did you know the secret is to soak them until the liquid is pooling around the cake and then to let it sit until it is drawn up into every morsel of the cake, creating a moist and yummy goodness? It is a fullness that almost seems excessive. It is too much- almost gaudy in the fullness and excessive nature. And it is because of the absolute fullness and a little bit of patience that we experience amazing rich yumminess. The cake sits as an island surrounded by impossible odds. And the magic that is food heaven happens when the cake just takes it all in. John and Mary knew that over-fullness. That excessive nature of God and that it would knock the socks off the world. So even in the shadows of possible death and silence of the prophets, they rejoiced. They offered up their lives, reputation, tears and fear in a refrain of rejoicing and in return, God granted them and the whole world who would come after them the hope and promise of something new- Jesus, our Savior, who would come to illuminate the shadows and offer us redeemed and eternal salvation, a celebration of love and intent for us all. So yes, we celebrate. We rejoice- always, in all things we find joy and we offer it up- because who wouldn’t rather laugh and dance?